I've never been the type of person that enjoys cooking for hours (unless sugar is involved). This is probably why most of my recipes only contain 3 essential ingredients (like strawberries & cream, rice pudding, banana peanut butter milkshake, surprise cheese snacks and blueberry chocolate explosion). Now that I'm a mom, I have even less time to cook and often end up forgetting to eat because I'm so concerned about giving my son all he needs. Lately, I often resort to this quick salad for lunch. It's packed with nutrients, and boosts the immune system to boot; what more could a new mom want? 1. 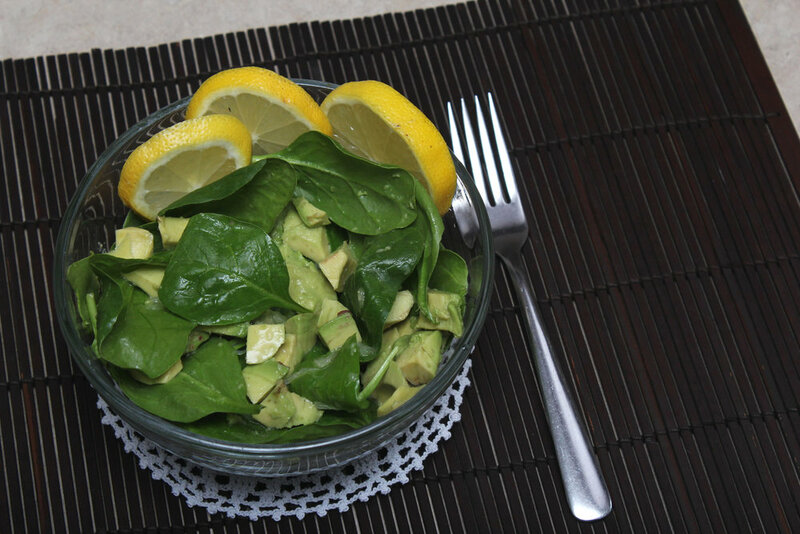 Cut the lemon & avocado. I added a touch of salt. Yum. 2. Squeeze the juice of half the lemon on the spinach. 3. Decorate with the leftover lemon slices and add diced avocado. 4. Enjoy your quick healthy meal packed with nutrients and immune boosting goodness.